The Fantasy Focus is a weekly column that breaks down everything you need to know to set your fantasy football lineups. Make your start and sit decisions with fantasy facts, injury information, matchups stats, predictions for the week and more. November is here, and that means we’ve officially entered the third quarter of the fantasy season. Just like an NFL game, a lot changes from one quarter to the next. It’s vitally important to be aware of these changes and to anticipate the direction things are moving in the NFL. At this point last year, we had only just started to pay attention to Alvin Kamara. He went on to shred the league in November and December and was a league-winner for a lot of teams. I wish I could tell you who that player is going to be this year, but my crystal ball is in the shop. But what I can say is that there will be players who emerge over the next two months. They always do. So it’s key to be proactive as you manage your roster. Look to churn the end of your bench each week on waivers adding deeper names at running back and wide receiver. Trim the fat on your roster by cutting lose players with limited fantasy ceiling. And for the love of all that good is holy, don’t waste your bench spots on defenses or kickers. Just like we saw in the NFL this week, fantasy trade deadlines are approaching in many leagues. So that’s another opportunity to bolster your roster for the stretch run. The best piece of advice I’ve ever received regarding trades is surprisingly simple: trade to make your team better. Trading a wide receiver and a quarterback for a wide receiver and a quarterback doesn’t make your team better. It’s a lateral move. If you need help at wide receiver, look to move another piece of your roster. Maybe you have good depth at running back. Okay, then start putting offers out to trade a running back for a wide receiver. However, with running back very thin in fantasy right now, be careful you don’t shoot yourself in the foot. For the fantasy playoffs, you need more than two running backs on your roster. To be comfortable, aim to have four running backs you’d feel confident in starting each week. Sure, two will be on your bench, but you have the depth to sustain any calamities that may happen down the stretch. Better yet, those backs can’t be used against you if you don’t trade them away. Russell Wilson is heating up. After a sluggish start to the season, Wilson has tossed six touchdowns over his last two games, posting QB1 fantasy finishes in each of those outings. A big part of his success is Wilson’s willingness to throw the ball to the end zone. 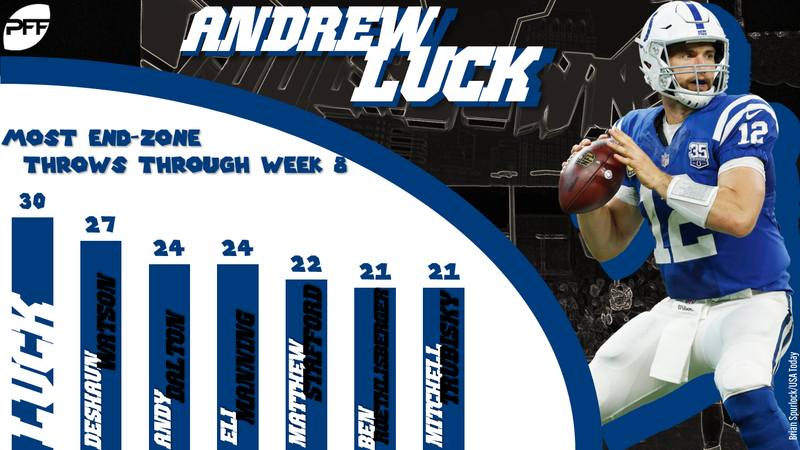 He tied Andrew Luck for the most end-zone throws this week with five, and has a massive 11 end-zone throws over his last two games. That number is especially impressive when you consider that Wilson threw just nine balls to the end zone over the first five games of the season. Speaking of Luck, he’s now the No. 2 fantasy quarterback, behind only Patrick Mahomes. Luck and Mahomes are the only two signal-callers in the league to enter Week 9 with more than 20 touchdown passes. His 23 touchdowns are especially impressive when you consider that only 10 quarterbacks topped that total last season. And this success is no fluke. He’s now leading all quarterbacks in end-zone throws with a massive 30 of them. End-zone looks are key to touchdown production for NFL receivers. Marvin Jones is coming off a big fantasy day where he posted a season-high 117 yards and the two scores. Both of Jones’ scores came on end-zone targets, and he’s currently tied for the league lead with 12 such targets on the season. Conversely, Jordan Reed has yet to see a single end-zone target on the season. Fantasy owners will be quick to tell you that he’s been a fantasy disappointment. Likewise, Rob Gronkowski has frustrated those who likely spent a second-round pick on him in redraft leagues. Like Reed, Gronk has seen minimal work in the end zone, with just two end-zone targets on the season. Only two players have topped 10 carries in the red zone over the last two weeks: Todd Gurley and Marlon Mack. Of course, Gurley is no surprise. He’s been far and away the most heavily used running back in the league and is on pace for 400 touches this season. But Mack’s usage certainly raises an eyebrow. Last week, He had five carries in the red zone and three carries inside the 5-yard line, scoring on two of them. Both totals were tied for the highest of the week. If this usage continues, it’s going to be hard for Mack to not post RB1 numbers the rest of the way. Yes, that’s ambitious, but it’s safe to consider him at least an every-week RB2 going forward. Byron Leftwich may or may not be the answer to Arizona’s offensive woes, but the team seemed to get back to leaning on Larry Fitzgerald and David Johnson in Leftwich’s first game at offensive coordinator. Johnson is an intriguing buy-low candidate given his volume so far this season. 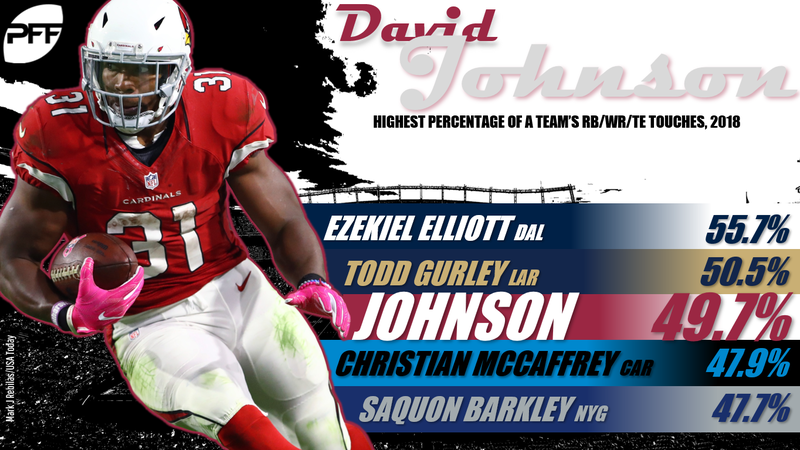 Only Ezekiel Elliott and Todd Gurley have seen a higher touch share than Johnson, with 146 of the Cardinals’ 294 touches. Fitzgerald’s arrow is also pointing up. Not only did he top 100 yards and find the end zone, but the veteran also saw two end-zone targets in the process. All eyes are on the Chiefs’ practice report Friday, as Tyreek Hill was a mid-week downgrade with a groin injury. Hill got limited work in on Thursday after being a full participant on Wednesday. While we aren’t quite in panic mode just yet, mid-week downgrades typically aren’t a good thing. However, if Hill is good to go, don’t even think twice about starting him this week. As long as he’s on the field, Hill is a WR1 play. Will Sony Michel manage to get back on the field this week? We don’t have an answer to that question just yet, but Michel has been able to get limited practice sessions in this week. But with New England, that really doesn’t tell us much. This is a tricky situation because the Patriots play on Sunday night. If you’re risk-averse, plan to not have Michel this week and keep him on your bench. Allen Robinson looks like he’ll again be sidelined this week. The veteran receiver missed last week’s contest and has yet to practice this week. Rookie Anthony Miller might be the biggest beneficiary if Robinson sits. Miller led the Bears in targets last week with seven and found the end zone in that contest. He’d be a sneaky DFS punt with some moderate appeal in deep season-long leagues. We still have no clarity on Dalvin Cook’s status. While Cook has practiced this week and told reporters that he “feels great,” the general expectation is that this injury will keep Cook sidelined until Week 11. That means we’re likely to get a least one more game out of fantasy rental car Latavius Murray. Then again, the way this season has been going for Cook, anything is possible. It’s also worth noting that Cook’s teammate Stefon Diggs hasn’t practiced this week, so keep a close eye on his Friday practice status. Ravens RB Alex Collins missed Thursday’s practice with a foot injury after he managed to get limited work in on Wednesday. This is a bad sign for his Week 9 status and will almost certainly be out if he misses practice again on Friday. If Collins sits, expect the bulk of the work to go to Javorius Allen, who would slot in as a risky flex play. The Jets are expected to activate Elijah McGuire off of injured reserve this week. The second-year back suffered a broken foot back in training camp. Before that point, he was being talked up as a potential replacement for Bilal Powell in the offense. He’ll now have that opportunity. He’s a sneaky add in deeper leagues. More injury notes: Keep an eye on the Seahawks practice report, as Chris Carson popped up on the injury report on Thursday. If he misses any time, Mike Davis would likely see a heavy workload. … Keke Coutee continues to be limited with a hamstring injury. While Demaryius Thomas’ presence certainly puts a damper on Coutee’s upside, he’ll still have fantasy value when he’s able to get back on the field. … It looks like Geronimo Allison will be good to go this week despite only getting limited work in on Thursday. However, his fantasy outlook isn’t particularly rosy as the Packers continue to find ways to work rookie Marquez Valdes-Scantling into the mix. … Cooper Kupp is expected to be back on the field for the Rams this week. He slots right back in as a solid WR2 option. … Royce Freeman has yet to practice this week and looks likely to be sidelined again. With Freeman likely out, expect another healthy dose of Phillip Lindsay. … The Redskins could be without Chris Thompson this week. Thompson is dealing with a ribs injury and has yet to practice. … Expect to see plenty of D.J. Moore again this week with Torrey Smith on the wrong side of questionable. After getting off to a blazing hot start, Robert Woods has cooled off over with no touchdowns over the last month. But look for Woods to get back on track against a New Orleans secondary that allowed touchdowns to Stefon Diggs and Adam Thielen last week. Woods projects to see his share of newly acquired corner Eli Apple. The former first-rounder struggled before being traded last week with 10 catches allowed on 14 targets over his last two games. Woods’ teammate Cooper Kupp figures to get back on the field this week and also draws a favorable matchup. Sure, P.J. Williams is the reigning NFC Defensive Player of the Week, but he earned that distinction despite allowing eight catches on nine targets for 114 yards and both Vikings receiving touchdowns. Kupp should immediately get right back on track. On the other side of that contest, Michael Thomas gets an extremely favorable draw with primary coverage projected to come from Marcus Peters. On the season, Peters has allowed 27 catches for 445 yards, which is an average of 16.5 per catch, and five touchdowns. Rams fans will be quick to point out that Peters is playing hurt, but regardless of the reason, opposing wide receivers have been putting up big fantasy numbers against Peters in 2018. Adam Thielen’s 100-yard game streak moved up to eight games and could very well continue this week. Thielen gets yet another plus matchup out of the slot against Nevin Lawson. 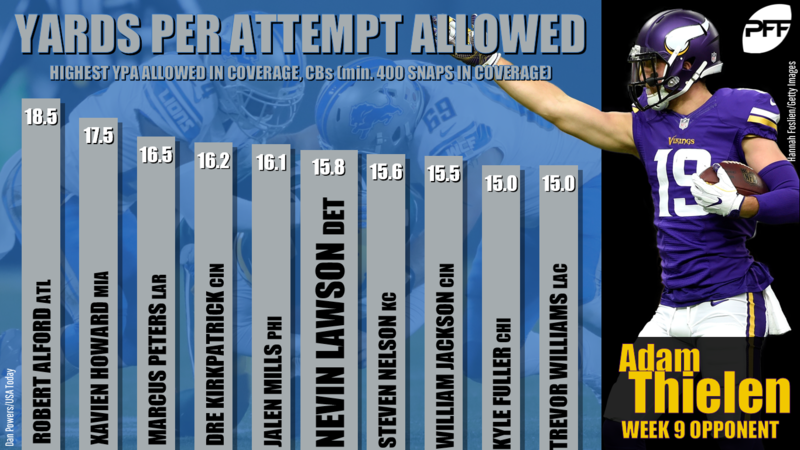 The Lions corner is allowing 15.8 yards per catch this season. He also gave up a touchdown last week to Tyler Lockett. Shadow coverage isn’t always a bad thing. That’s certainly true this week for Mike Evans, who projects to see a shadow from James Bradberry. The Panthers have asked Bradberry to shadow opposing No. 1 receivers for much of the season, and he’s been far from shut-down. Bradberry is allowing a 63.5% catch rate with wideouts finding the end zone in his coverage in three of the last four weeks. Devin Funchess is coming off a down week against the Ravens, but don’t let that dissuade you from starting him. Funchess gets a major matchup boost against a Buccaneers secondary that has allowed the second-most fantasy points per game to wideouts this season. Funchess will draw primary coverage from Brent Grimes, who has struggled to keep opposing wideouts in check. Grimes is allowing a 71% catch rate with receivers averaging 14.2 yards per reception in his coverage. With Golden Tate out of the mix, we can expect a healthy dose Marvin Jones and Kenny Golladay going forward. Jones is coming off his biggest fantasy performance of the season, but he could come back to earth this week. He’ll likely draw a shadow from Xavier Rhodes. While the Vikings corner hasn’t necessary been an elite player on the field this season, he hasn’t allowed a touchdown in his coverage since Week 2. You’re going to start Davante Adams every week in season-long leagues, regardless of his matchup. However, it’s a good idea to fade Adams in DFS this week. He gets a tough draw with shadow coverage likely to come from Stephon Gilmore. The veteran corner has allowed just 18 catches on 44 targets. Only Richard Sherman is allowing a lower catch rate this season. It’s been a frustrating season for Corey Davis owners, and that isn’t likely to change in Week 9. Davis returns from bye and gets an absolutely brutal draw with coverage projected to come from Byron Jones. The Cowboys corner is in the midst of a breakout season and currently grades out as the No. 1 corner here at Pro Football Focus. In seven games, Jones has allowed just 13 catches on 25 targets. Only eight wide receivers in the NFL have more than five touchdowns through the first eight weeks of the season, and Tyler Lockett is one of them. The Seahawks receiver has quietly put up top-20 fantasy numbers over the first half of the season and should continue to be productive with Russell Wilson surging. However, you may want to look to fade Lockett this week, as he’s likely to draw a shadow from Casey Hayward. The Chargers corner has allowed just 15 catches on 26 targets this season. Sammy Watkins was one of last week’s biggest fantasy plays with eight catches for 107 yards and two scores against the Broncos. While those numbers certainly jump off the page, fantasy owners may want to consider sending Watkins back to the bench this week. Not much has gone right for the Browns this season, but one thing that has is the play of rookie Denzel Ward. He’s holding opposing receivers to just 10.5 yards per catch with a stingy 54% catch rate in his coverage. The Dolphins have been one of the most fantasy-friendly teams to opposing running backs this season, allowing 125 rushing yards and 0.9 touchdowns per game to the position. While Isaiah Crowell hasn’t done much to impress this season, he’s an appealing upside play in this matchup. Let’s not forget that Miami just surrendered a big fantasy game to Lamar Miller. Matchup data suggests that the Falcons are a plus matchup for running backs, but it’s important to do a little digging before you get crazy with Adrian Peterson. Atlanta has actually only surrendered one 100-yard game to opposing backfields. That said, the Falcons have also given up seven scores to running backs in seven games. So Peterson may not have the biggest yardage day, but he’s a good bet to reach pay dirt. Nick Chubb has racked up 18 carries in each of his first two games as the starter in Cleveland. Look for the new regime to feed Chubb early and often in a plus matchup this week against the Chiefs. Kansas City allows 5.3 yards per carry to running backs, which is second behind only the Lions. Opposing backfields have topped 100 rushing yards against the Chiefs five times this season. Speaking of the Lions, they’re currently the No. 7 PPR matchup for running backs, which means good things if you own Latavius Murray. Detroit just got torched by Chris Carson and have surrendered a rushing score to running backs in each of their last two games. James Conner faces an uphill battle this week against a tough Ravens defense that currently allows the fewest fantasy points per game to running backs. If there’s any solace in this matchup, it’s that the Ravens have given up rushing scores to the position in each of their last two games. Regardless of the matchup, it’s impossible to fade Conner in season-long leagues right now. With Alex Collins banged up on the other side of that matchup, the Ravens could turn to Javorius Allen as their lead back this week. While it might be tempting to fire Allen up, be careful with this one. Pittsburgh has been extremely stingy against opposing running backs with only the Ravens allowing fewer fantasy points per game to the position. 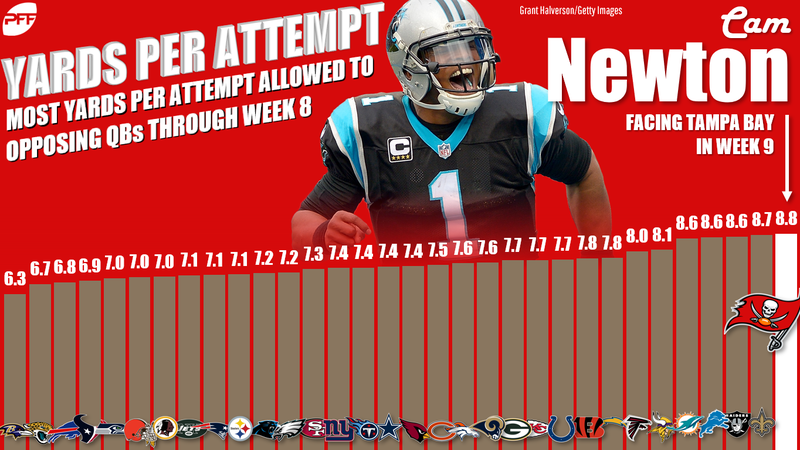 Cam Newton is set up for a big day in Week 9. He squares off against a Bucs defense that has been extremely generous to opposing quarterbacks this season. Opposing signal-callers average a whopping 8.8 yards per attempt against the Tampa. The Bucs have also allowed 13 touchdown passes over their last four games. Like Newton, Jared Goff is poised for a big day against an NFC South team. Goff faces a Saints defense that has been nearly as bad as the Bucs with 8.7 yards per attempt allowed to go along with 15 touchdowns surrendered on the season. Look for Goff to put up one of his better fantasy days of the season in this contest. While the Seahawks may not be the Legion of Boom any longer, we shouldn’t overlook the fact that Pete Carroll’s squad is currently the worst fantasy matchup for quarterbacks. Through their first seven games, Seattle has allowed more than one passing score just three times. It’s a good idea to fade Philip Rivers this week. Mitchell Trubisky is in the midst of a breakout season and enters Week 9 as a top-10 fantasy quarterback. But he has a tough task ahead of him having to travel to Buffalo to face a Bills defense that allows the fourth-fewest fantasy points per game to quarterbacks. Don’t be shocked if Trubisky comes back to earth this week.